This knife measures 9.5 inches overall, with the straight edge blade measuring 4.85 inches in length and width of 0.185 inches. It is fairly light weight, largely because of the handle which is made from glass reinforced nylon; SOG say that the weight is 5.4 ounces, but in fact it weighs 5.7 ounces. Nevertheless, it is certainly light enough for backpacking when weight is a major consideration. But don’t let that fool you. The SEAL Pup Elite is as tough as nails, which you would expect from a knife designed for the Navy SEALs. 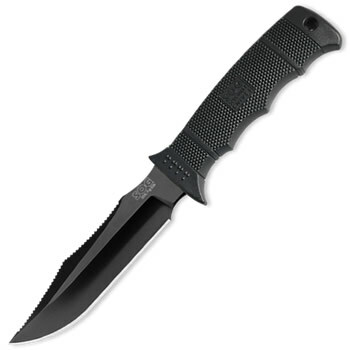 The straight edged blade is made from AUS-8 steel and has a clip point shape. On the Rockwell scale of hardness it clocks in at 57-58. Out of the box, the blade on this knife, which is hollow ground, is EXTREMELY sharp – indeed many users report being able to shave with it. What’s more is that it holds its’ edge over long periods of use. This is very much down to the SOG manufacturing method which involves cooling the blade slowly down to more than – 300 degrees F and then gradually returning it to room temperature. This stress increases the overall strength of the blade as well as the edge retention and makes it far less likely that it will suffer from edge chipping or micro-fracturing. One user reported testing the blade straight out of the box by cutting up a store bought fresh chicken. His experience has been that cutting through slimy chicken skin can easily dull a blade, but this knife did the job with ease, cutting through bones as if they weren’t there. He was able to cut out the wishbone with surgical precision. Another owner was showing off the knife to a friend who accidentally dropped it, point first, on to his concrete floor. He said that his heart stopped for three beats, but all that happened was a small chip was taken out of the floor, with the blade remaining undamaged. The blade has plenty of jimping on the spine which makes for a sturdy, non-slip surface for tasks where you may be required to choke up on the blade, such as whittling or carving. As far as processing and gathering fire wood, it does a decent job. But the shape of the spine is limiting as there is very little flat surface area on the spine of the blade for batoning. If your primary purpose is chopping and splitting wood then a knife with a longer, heavier and thicker blade with a flatter spine would be preferable. Nonetheless, it works very well for small timber for use in fires and so on. Much of the work of cutting is done on the part of the blade nearest the handle; the blade edge on the SOG SEAL Elite starts much closer to the handle than on some of the other versions which makes slicing easier. The handle is made from glass reinforced nylon and has a lanyard hole. The full tang goes all the way through to the hole. While the handle does feel a little light to some users, it is nonetheless comfortable and grips well – it feels good in the hand and provides a secure grip. The material maintains high traction even when your hands are wet. One owner reported backpacking for a week in really wet weather when his hands were constantly wet, but the knife never slipped from his grasp once. The SOG SEAL Pup E37S-N comes with a nylon sheath as standard but there is also a version of the SEAL Pup available that includes a Kydex sheath for a little extra cost. The nylon sheath has MOLLE compatible webbing on the back and can be fitted in a number of different ways. The blade housing has a liner which protects the sheath material, but a little care is needed to avoid cutting the handle snap fastener when withdrawing and sheathing the knife. One user also pointed out that this would make the knife a slow draw which is not exactly ideal for tactical purposes. Two holes are located at the bottom of the sheath for tie down points. On the front is a storage pocket which is of a decent size for housing a sharpening stone and/or fire starters. 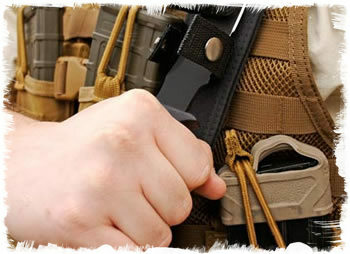 Keep in mind the Kydex sheath version does not have this pocket or a MOLLE system, but does have a notch exposed for quickly cutting line without removing the knife from the sheath. 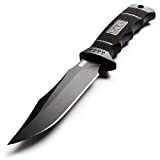 If you need a really great all-round tactical or survival knife the SOG SEAL Pup Elite E37S-N is probably as close as you will get to perfection in a knife with this blade size and price range. It was thoroughly tested by the SEALS before being decided upon as their knife of choice, using every test they could devise, including salt water immersion for two weeks, gasoline and acetylene torch resistance, cutting six different kinds of rope, handle twist off force, tip strength testing and many more stress tests that a lot of lower quality knives would fail to survive. If your primary purpose is processing firewood or medium to heavy chopping tasks then you might want a knife with a longer blade or even better a kukri, small hatchet or ax. Some people also find the SEAL Pup Elite a little light, (of course this could also be a benefit for hiking and backpacking) although most who have held this knife would agree that the handle grips very well and the strength is very high for such little weight. The nylon sheath is not quite as ideal for tactical purposes, so I would suggest going for the Kydex model. Those two minor gripes aside, you probably won’t find a better all-purpose medium sized knife for the money; many owners compare it favorably to knives costing $200 or more.